New skincare ranges are being launched all the time or so it seems to me lately, but it’s not often that a person that I know dares to dream big and launch a skincare brand within a couple of years of conceiving it. You might already be familiar with Danny, a wonderfully knowledgeable beauty blogger behind Holistic Green Beauty but now he took a big step into the spotlight in a different capacity – that of a founder of a skincare brand, alongside his business partner Scott. Danny is quite young but ever since we started our first conversation about skincare, I knew that his interest in the subject ran quite deep. When Danny started developing products I was ‘entrusted’ with the secret and kept true to my word, even when he has sent me samples that were met with glowing approval by my skin and girlfriends or colleagues started asking what I was using or doing to my skin. To see someone realise his dream is a privilege, to be a trusted friend is an honour but to officially review that products is somewhat daunting, because I need to be honest, yet I feel protective towards Danny from the day when when Holistic Green Beauty was just a dream that he chose to confide in me. Truth be told, I needn’t have worried, as Danny takes skincare genuinely seriously and his perfectionism shows as soon as you pick up the packaged products. Danny has sent me preliminary information before an official launch and asked me what I wanted to try, having enquired about my skin type, just to be sure. 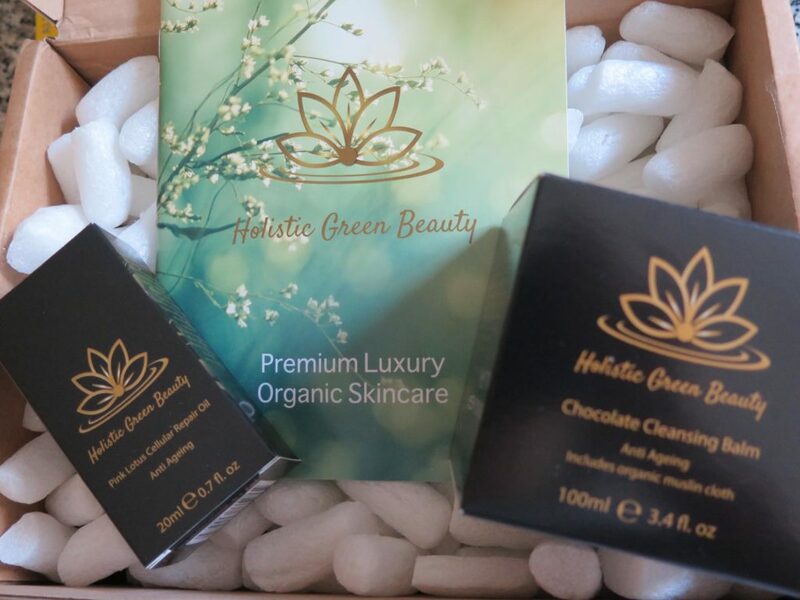 I also took on board his recommendations and in late October I received a parcel with two full-sized products, a Chocolate Cleansing Balm and a Pink Lotus Cellular Repair Oil for my face. So the trial began, with me wearing ‘triple’ hat: that of consumer, of a journalist and the heaviest of them in this instance, a friend. The packaging is subtle but eye-catching and unique, you certainly won’t confuse it with another brand. There is reflection in it and attention to detail and the jar for the cleansing balm, as well as the face oil & mist bottles are made from Miron glass, to protect the ingredients and formula potency. Now, let me start with the HGB Chocolate Cleansing Balm that you are initially more likely to want to lick than put on your face, as it smells of chocolate, cookies and caramel – the best desert not meant for your stomach. Danny told me that the balm is solidified and to make sure I don’t keep it in a warm place, as it can melt. The jar comes with a little spatula with which you are meant to scoop a small amount of the product (making sure you don’t introduce dirt or bacteria in it, thus keeping the ‘integrity’ of the formula intact), put it on the tips of your fingers and gently emulsify it for a few seconds, before massaging it thoroughly all over your face, in the upward direction. By the time you start massaging the balm into your skin it softens and turns into a consistency that I can only describe as an almost liquid oil that smells of enticing happiness. Focus on massaging your face for at least thirty seconds ( regular massage stimulates the cells that release collagen, thus improving skin elasticity ), add some water, massage further, with a cleanser emulsifying and then take a muslin cloth that comes with the cleanser and wash it off you face. Danny & Scott recommend using the cloth in the evenings, for gentle exfoliation. To be honest I prefer to wash the cleanser off with my fingers and warm water, without the use of the cloth but bear in mind that a clean (!) cloth used daily will act as a gentle exfoliator and buffer for your skin, which is beneficial for speeding up cell turnover from 30 upwards. I have also tried using it with my Foreo and while the result is good, I still prefer to massage this product in to my face with the tips of my fingers, varying degree of pressure, inhaling the scent and letting the worries of the day go down the drain with the water. Goodbye grime and daily worries, hello beautifully cleansed, soft skin that feels moisturised even before I apply anything to it, following the cleanser. – Wild-crafted Mafura Butter & Organic Cacao Butter: revitalises, calm & nourishes, leaving skin super soft. – Acai berry, Organic Cacao extract, Green Tea & Rosehip: potent antioxidants that help to fight free radical damage. – Organic Coconut, Almond, Avocado & Sunflower Oils: hydrate skin & provide it with essential nutrients that boost radiance. – Calendula & Copaiba: sooth skin & help to decongest it. HGB Pink Lotus Cellular Repair Oil is one of the two oils that is part of the initial Holistic Green Beauty product release, in part because Danny and Scott are big believers in the efficacy and power of facial oils, provided they are created from high quality ingredients. This oil is seabuckthorn orangey in colour and does have a strong smell – I wasn’t initially sure of it but after a few days of use, it grew on me. Scent is a very personal thing – some of us prefer stronger smelling products, others like subtle smells and of course there are those who like scent-free products for various reasons. One or two drops of the oil ( the pump is quite good at dispensing the right amount of the oil that you will need and it doesn’t create a mess that some pumps do, spraying contents everywhere ) is enough for your face and neck. Apply it to a slightly damp skin and with gentle upward strokes massage it all over, avoiding lip and eye area. You can use it both in the morning and evening but I ‘tested’ it by using it at night-time. When you apply it, it leaves behind some sheen initially. Having said that, this oil sinks in within a couple of minutes without a trace, so you can easily apply make-up on top of it, if using it in the morning. The main aim of this particular face oil is to help repair & heal the skin from the damage inflicted by daily stress and pollution. It not only hydrates your skin ( and is even more effective when you apply it to slightly damp skin) but helps to improve elasticity (thus making wrinkles and fine lines more plumped up then grooved into your face), assists in repairing sun damage ( consider incorporating sun protection into your daily skincare routine and your skin will thank you by somewhat ‘slower’ appearance of the signs of ageing, like pigmentation ) and adds radiance to lacking complexions. And thanks to the Pink Lotus, known for its antioxidant properties and natural AHAs, you cell renewal process will be improved, which is particularly handy if you are – no, not over the rainbow, but over the age of 30. Would I say it is the best face oil that I have tried, considering the price? No, it didn’t move my favourite face oils off from the shelf for the time being but it certainly deserves the spotlight for its reparative properties alone, as the list of ingredients that work hard on improving your skin, particularly if it has taken the beating from the elements, stress and pollution is impressive. Would I buy it myself ? In order to answer that question, I will need to finish the bottle first and look in the magnifying mirror without prejudice. For now my skin is plump and even but I at this stage I, personally, contribute this to the effect of the cleanser. I have , however, been getting compliments on my skin lately, which is a good endorsement of the skincare routine that I currently follow. – Organic Rosehip & Argan help to repair sun damage & assist process of cell regeneration. – Calendula: known for its anti-inflammatory properties, it helps to repair skin tissue. – Coenzyme Q10 & Acmella Flower extract: helps minimise appearance of wrinkles by smoothing and firming skin via stimulating healthy collagen production. – Acai, Goji, Sea buckthorn, Sacha Inchi berries, Green Tea, Pomegranate: help to neutralise free radical damage.